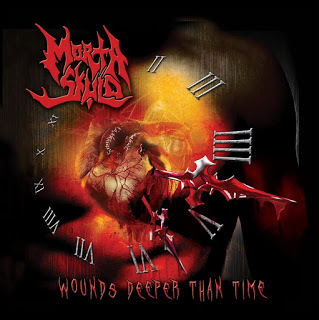 Finally coming back into the fold, Wisconsin death metallers Morta Skuld have been toiling away in the underground ever since the beginning of their career and especially once they reformed several years back for a nice reunion that’s still on-going. With a new lineup with second guitarist Scott Willecke and bassist AJ joining the fold, the groups’ first post-comeback and fourth full-length overall effort will be released February 17, 2017 on Peaceville Records. Despite the long layoff, it’s quite clear the band hasn’t lost their step at all as there’s plenty of life left for the group to explore based on this one. Pumping out efforts like Breathe in the Black, Hating Life and Against the Origin, there’s such classic-sounding material filled with plenty of charging mid-tempo riffing and pummeling rhythms that keeps the material tight, intense and straightforward much in the same way that they usually offered in the past, making for a slew of crunchy, highly-impressive efforts. Due to the chaotic nature of these efforts, there’s plenty to work with here once this manages to get the majority of the albums’ running time with these rhythms, so when it changes over into its more mid-tempo elements with My Weakness, In Judgement and Becoming One Flesh there’s a natural balance between the ravenous, crunchy patterns and more mid-tempo, straightforward work that still slogs through the same general intensity and savageness which is what makes for the more cohesive and engaging type of work throughout here. As this is all quite common and expected with the band, that they’re able to reproduce this type of influence and clarity in this day and age makes for quite an impactful time here as this one keeps their old-school tone intact here with a great deal of their changing tones that was quite apparent throughout their catalog. While that’s all good, there’s a decidedly more modern feel and tone in the production that sounds way too clean and processed for such an old-school vibe from the arrangements of the tracks, and that does stick out throughout here quite apparently rather than the murky old-school feel. Still, that’s the only thing really wrong here.